Avid readers of this website may recall a previous article on the erection of a chicken/goat proof fence, around a 25m x 15m parcel of land adjacent to the Mayega Children’s Centre. 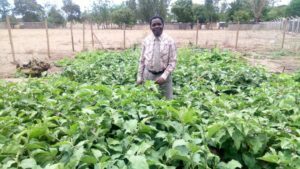 The ground was then developed through planting leguminous jack beans and addition of cow and chicken manure. But the kitchen garden remained ‘in preparation’ until earlier this year, when the water supply reached the centre. Bingo! Staff and children have turned the opportunity into a flourishing vegetable patch. The photos show the variety of vegetables being grown, and so available to improve the children’s diet. 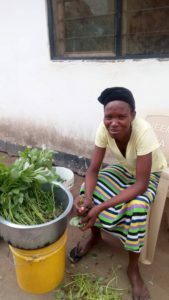 One picture shows Rose, our Assistant Cook, preparing mchicha, a local form of spinach. How inspiring are these photographs, and they show what can be done even in the arid conditions of Mayega, with a reliable water supply. The Mayega Water Group are awaiting the outcome of a funding application to increase the number of standpipes across Mayega village and then the kitchen garden can become a village teaching garden, for experimentation and training. How great it is that the Children’s Centre are showing what can be achieved.